A strong business model is the bedrock to business success. But all too often we fail to adapt, clinging to outdated models that are no longer delivering the results we need. 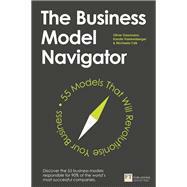 The brains behind The Business Model Navigator have discovered that just 55 business models are responsible for 90% of the world's most successful businesses. These 55 models – from the Add-On model used by Ryanair to the Subscription model used by Spotify – provide the blueprints you need to revolutionise your business and drive powerful change. Prof. Dr. Oliver Gassmann is professor of Technology Management at the University of St. Gallen, Switzerland, and Managing Director of the organisation. He is ranked one of the 5 top-most cited professors by the German Academic Association for Business Research and is one of the most influential economists in Germany, as well as one of IAMOT’s top 45 researchers worldwide. Dr. Karolin Frankenberger is an assistant professor at the Institute of Technology Management, University of St.Gallen, Switzerland. Before joining the institute, she was a consultant at McKinsey & Company for several years, helping various clients in topics such as business model innovation and strategic change. 4 AUCTION – Going once, going twice… sold! 36 PAY WHAT YOU WANT – What is its Worth to You?